The Pelamis WEC is a semi submerged, articulated structure composed of cylindrical sections linked by hinged joints. Motion from the waves is resisted by hydraulic rams, which pump high-pressured oil through a system of hydraulic motors via smoothing accumulators. The hydraulic motors drive electrical generators to form electricity. The device is moored to a fixed location but can weathervane to face incoming waves for maximum power generation. The joints used to connect each tubular section are configured to induce wave power from small sea states. The movement in the joints can be actively controlled to make use of the phenomenon of resonance, allowing generation to be maximized in small seas, and the machine response to be minimized in storms. Generated power is fed back to shore using standard subsea cables. The Pelamis is moored to the seabed using standard embedment anchors. The device is 180m long, 4m in diameter, and weighs 1300 tonnes. The two utilities will be testing their machines in tandem as part of a unique cross-industry collaboration project. Information gathered from the trials will be used to support the development of larger commercial-scale projects currently under development by both ScottishPower Renewables and E.ON off the coast of Orkney. The machine is connected to its onsite anchoring and electrical systems via a rapid subsea attachment system located at the end of the yoke, which hangs vertically when the machine is installed. This allows the machine to be quickly and safely installed and removed on site in a range of sea states and using non-specialised vessels, enabling maintenance to be carried out at the quayside. Both ScottishPower Renewables and E.ON were awarded separate leases by the Crown Estate for projects off the west coast of Orkney utilizing Pelamis P2 technology. The Billia Croo test site already had a pre-consented agreement in place, which allowed for minimal licensing requirements. 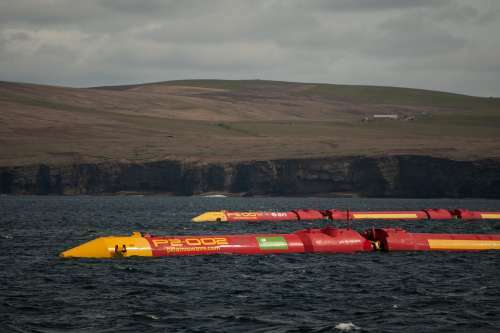 In 2004, Pelamis Wave Power (formerly Ocean Power Delivery) created a full scale WEC prototype for testing at the Orkney site of Billia Croo at EMEC. This Pelamis machine was the first WEC to supply electricity to the national grid from offshore wave power. After implementing design improvements to the prototype, Pelamis returned to the Orkney test site in 2007 in advance of deploying three P1 machines in Portugal in 2008. In 2010, E.ON UK began testing of the Pelamis P2, a second-generation device developed, manufactured, and operated by Pelamis Wave Power. A second P2 device was deployed by ScottishPower Renewables on an adjacent berth to E.ON’s device as part of a unique joint working arrangement between the two renewable energy developers to maximize learning from operating and maintaining the machines as a wave farm. However, in November 2014 Pelamis Wave Power went into administration and was unable to secure a buyer for the business in the following weeks. As a result the company ceased trading. Decommissioning of the SPR P2 device began in 2016. Baseline studies for the Billia Croo test site were performed by EMEC and can be found here. Device-specific studies are to be conducted by developers. Noise production can place marine mammals and fish at risk of experiencing permanent or temporary loss of hearing sensitivity, though previous studies have shown this to be insignificant. The Pelamis device is tolerant to marine growth and can avoid harmful anti-foulants by using a standard marine paint coating. The mooring systems may cause scouring and affect the seabed, but the footprint is minimal and easily removed. More details can be found at the website listed below. Pelamis Wave Power P2 Demonstration at EMEC is located in United Kingdom.